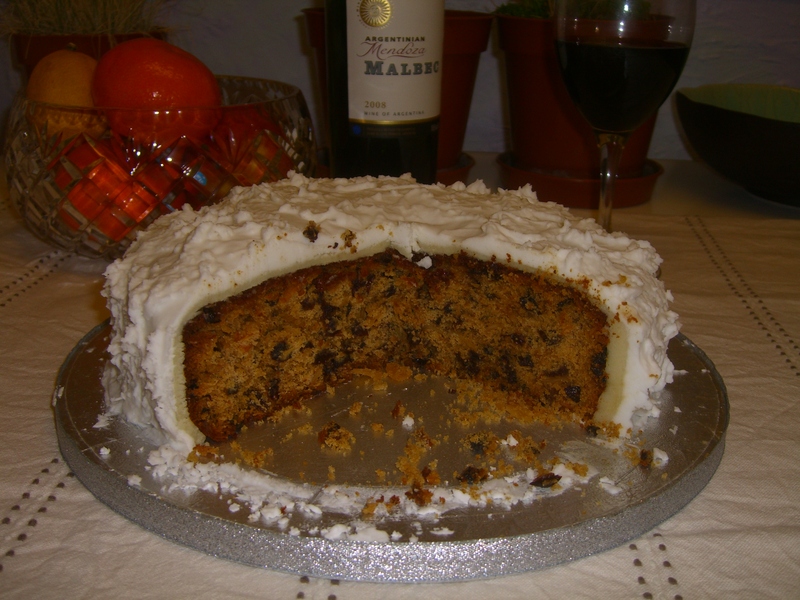 This a “fast Christmas Cake” recipe, and doesn’t need to be made months in advance. Basically you throw “mincemeat” (the mixed fruit you get in mince pies) in with flour and other basic ingredients, bake, then put some marzipan on (shop bought). It then gets left for a week (I don’t know why…) before getting covered in the amazing looking “Royal Icing”, which is icing sugar, egg and water in a really thick solution. You ooze that onto the cake, then as it dries create the little “peaks” for decoration. As for taste, its pretty good. Soft and moist compared to traditional Christmas Cake, but with a fairly standard taste that doesn’t scream originality. This makes it better than most shop bought cakes, but you might beat it with a luxury buy. Well, I suppose Christmas Cake is eaten everywhere the Empire has been for a reason – it is hard to improve on! All in all, quite a success. Who made it: a joint effort between Anna and Dan, with Anna doing the bulk of the planning. Recipe: Mary Berry’s Ultimate Cake Book, page 99.